While the CB radio remains the most popular method for vehicle-to-vehicle communication on the trail, assembling a off-road CB system can seem complex. The vast array of available radios, antennas and mounting solutions can cause confusion and uncertainty for those unfamiliar with CBs. Fortunately, CB systems are simple and assembling a complete off-road installation is straightforward if you understand a few key principles. Length: The longer the antenna, the better performance you’ll receive. A 3’ to 4’ length is generally recommended. You want to make sure that, at a minimum, the top of the antenna is slightly above the roof-line of the rig. Flexibility: You want to make sure your antenna can survive a few hard shots on the trail; breaking an antenna half-way through an off-road adventure is no fun. 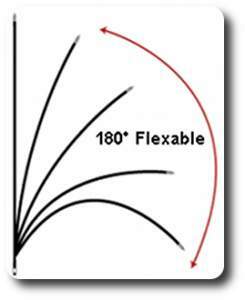 It’s smart to get a flexible antenna (which are marketed as such), or to add a spring to a stiffer antenna to provide flexibility and prevent breakage. Type: The Wilson FLEX and Firestik FS are two of the most popular off-road antennas available. The Wilson is ideal if you want a really flexible antenna, and the Firestik is the better option if you want the best possible performance. While there are other quality antennas available, these two are very popular and are highly recommended. 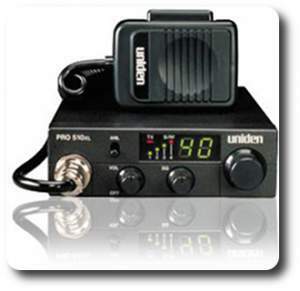 When picking a radio, the most important thing to remember is that all CB radios are limited to 4 watts of transmission power by the FCC. This means that all CB models will transmit at the same range, everything else equal. Picking a radio really comes down to deciding which bells and whistles you want. The good news is that it’s possible to get a basic, bare-bones radio for around $50 that will transmit just as well as a high-end $150 unit. So what should you consider when picking a radio? Space is at a premium in most 4×4 off-road rigs and you should strongly consider size when picking a radio. Also, you’ll want to consider durability and reputation. Cobra and Uniden are two well respected manufacturers to consider. Specifically, the Uniden 510/520 series and the Cobra 75 models are extremely popular with off-road drivers due to their compact size and reputation for reliability. You’ll also want to consider getting your radio “Peaked and Tuned”. With this upgrade, a CB shop will adjust your radio’s output power up, generally to between 8-14 watts, increasing the transmission range of your CB. Is this a necessary upgrade? It really depends on how you’ll be using your radio. If you plan to talk to other vehicles in your caravan on the trail, it’s not necessary. A “stock” CB with a 3’ fiberglass antenna should have no problems talking a mile up and down the trail. However, if you want additional range for your CB and increased performance when the terrain gets tight and varied, a “peak and tune” will give you 2x to 3x the range of a stock radio. 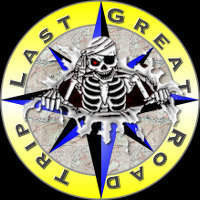 Just remember this is not in line with the FCC rules. For FJ Cruiser owners, the most convenient and popular way to mount a CB antenna is to use the Bandi Mount. 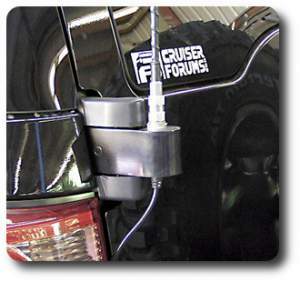 A proprietary mount created by a member of FJCruiserForums (blue forums), the Bandi Mount allows FJ owners to install a CB antenna using the rear door hinge – no drilling required. Other popular mounting options include “L” brackets that allow mounting on the bumper and vertical vehicle surfaces, as well as hood channel mounts which make it easy to install a CB antenna along the vehicle’s hood. When purchasing coax cable to connect the antenna mount and the radio, make sure to buy from a quality manufacturer such as Belden or Firestik. Cheap coax cable can be poorly manufactured, resulting in premature failure and/or sub-par system performance. Once you finally get everything installed, make sure to tune your CB antenna before use. Not to be confused with a radio “peak and tune”, antenna tuning makes use of a SWR meter to adjust your CB antenna for peak performance on your specific vehicle. Most antennas will included detailed tuning instructions on the packaging. 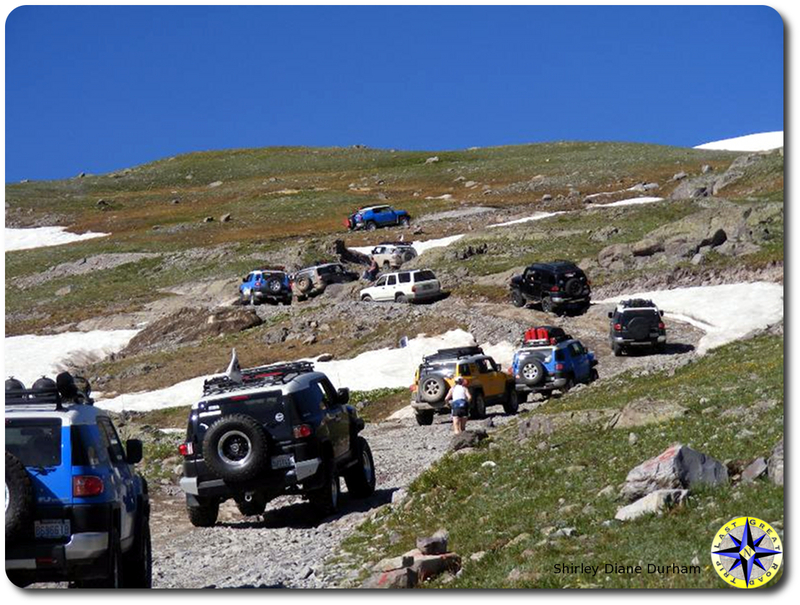 Make sure to purchase quality components and choose a suitable mounting location and you should enjoy years of trouble-free CB operation on the 4×4 trail. Video instructions for installing Cobra 75 wx st CB Radio install FJ Cruiser.